Urbana senior Jacob Ratcliff illustrates the convergence of old and new research methods in Urbana High School’s media center, using both a laptop and paper for school work. Urbana will implement a 1-to-1 device program for grades 6-12 next year, allowing each student in those classes to have access Chromebooks..
Times change, and the tools and resources available to a successful community must adapt accordingly. For students in Champaign County, that means “libraries” become “media centers” and encyclopedias are replaced by the internet. Still, print resources are far from disappearing entirely in local schools. At Urbana, the new school buildings have sparked a renewed vigor for state-of-the-art education. That means new learning spaces, new technology assets and expansion of device offerings. Some districts already offer one technology device for every one student for a 1-to-1 access ratio. That’s not the only upside for educators, either, as communication has improved dramatically. “Many teachers use Google Classroom to post assignments and information for classes – which assists all students. It is especially helpful for students who may need to miss a class or a day due to academic competitions, field trips or illness,” Mays said. What that means for students at Urbana is fewer trips to what once would have been a library of books or a computer lab for research and more instruction time. At Graham, the district has renovated its media centers to add practical learning spaces. The result is a space that has a high demand and access to devices that students and teachers alike are craving. Not only is Graham promoting research and academia with its print resources, it’s also promoting creativity. Koennecke is especially proud of the district’s commitment to a wide variety of resources, which includes a space specifically for graphic novels in the elementary. 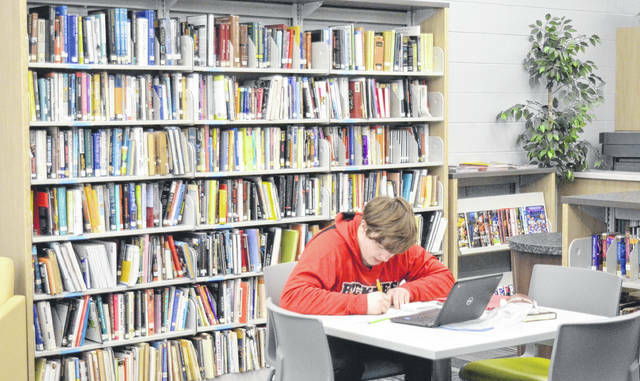 At West Liberty-Salem, students in the newly-renovated campus may have noticed a reduction in the number of books available, but Superintendent Kraig Hissong noted that disposal was strategic. The WL-S media center has a computer lab and a smattering of books still available with a wide-open space and access to projectors and monitors that foster group collaboration. That’s especially important to younger students, who don’t have individual device access like the high school. “We’re 3-to-1 at the elementary, but at the high school we’re 1-to-1. And they take those home,” Hissong said. At Triad, the district will open the 2019-2020 school year with a 1-to-1 technology approach for the first time. ”Most district and community ‘libraries’ are moving to more of a ‘media center’ concept. Triad really has more of a typical library concept at this time – books, magazines, et cetera. But students can bring technology into the library to access print online,” Superintendent Vickie Hoffman said. Hoffman recognizes the need to shift the district’s focus, but noted that the school would ideally cater to student preference. At Mechanicsburg, the district focuses heavily on rotating its collection of resources to reflect the school’s current climate of education. ”I can tell you that books are not disappearing from our media center! We take pride in adding books to our collection while being sure to update and rotate our collection based on student interests, accuracy of the publication, age of the book and condition of the book,” Superintendent Danielle Prohaska said. “However, a good media center has a variety of selections and modalities available for students including actual books, hands on materials for building and exploring, and technology-based access to book collections and online reading. 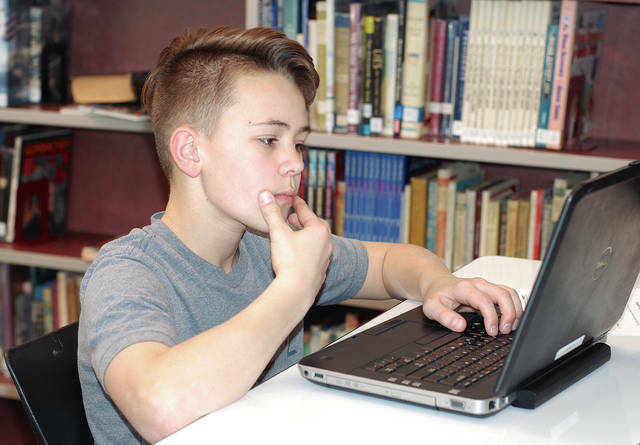 Mechanicsburg employs a 1-to-1 technology program for students in grades 5-12, which aids in that access. ”The Chromebooks are used as a tool to enhance our rigorous instruction. Technology is not a replacement to instruction but a powerful support that allows students to explore, apply and extend learning in ways meaningful to their futures. We use technology to support our portrait of a graduate and to make sure all students leave Mechanicsburg schools prepared for enlistment, enrollment in post-secondary learning, or employment,” Prohaska said. Today’s technology offers a broader access to information, but students in Champaign County can still access a book. And for some students, books are no longer just about words on a page. Sometimes they’re words on a screen. Author’s perspective: For all the differences between yesterday’s library and today’s media center, we should all be able to agree upon our need for students to develop into functional adults. And for that to happen, we need to embrace all types of learning technology – both old and new.